Engines lift clear of the water when sailing. 60 l / h petrol engine driven watermaker and 5 l / h electric watermaker. 12 volt, 4 batteries charged by: engine, wind generator, solar panels, generator Solar panel 600w (2 x 250w + 1 x 100w) + MPPT charge controller giving 60A. AGM Batteries 4 x 12V (134 A/h). 2 x Inverters 1500 W and 300 W.
Marine Ply on Mahogany sheathed with west systems epoxy & glass. 8 x 20 L plastic Jerry cans for fuel. The 2nd heads is currently used as storage. The bilge pump is a portable electric type. 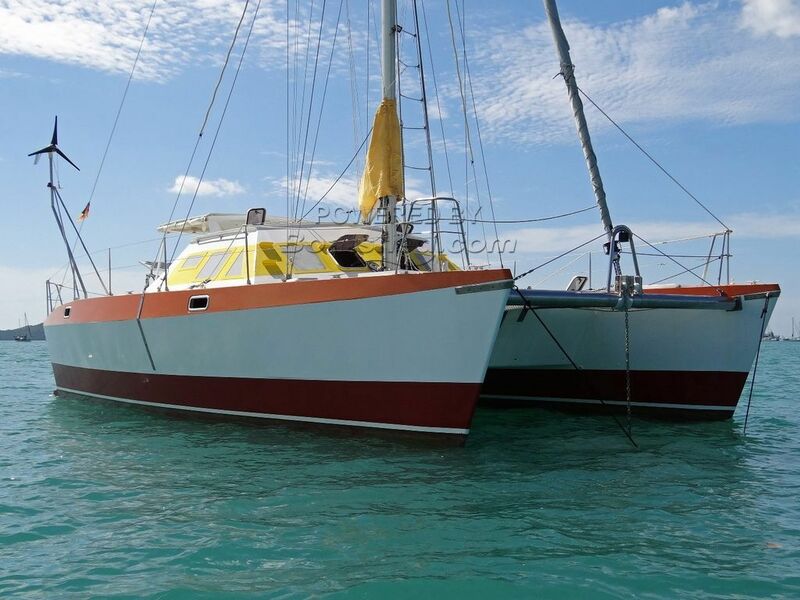 A very spacious, well equipped and well set up cruising cat with lots of recent upgrades and equipment. She has two watermakers and a rain catchment and filtration system that can fill the 200 l S/S water tank, with good drinking water, in an hour in a good downpour, so you are never out of water and she has 600 W of solar power so you are never out of power. With a bridge deck clearance of 0.9 m and very manageable cutter rig she is easy and comfortable to sail. A very nice feature for the tropics is a net that can be rigged between the hulls for lazing in the water under the shade of the bridge deck ! Contact us for owner's full spec. This Hitchhiker 40 Catamaran has been personally photographed and viewed by Alan Giles of Boatshed Phuket. Click here for contact details.